Spring is the season of renewal and new beginnings, so why not renew your love of reading and films with these new titles available in April? 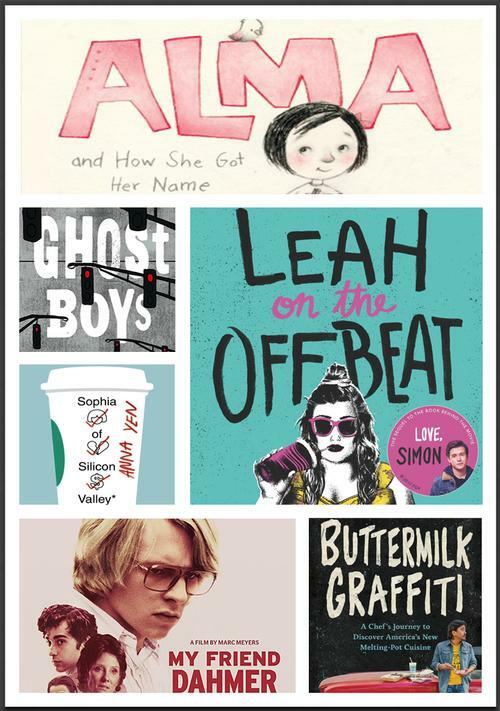 There are serious, off-beat, thrilling, and funny suggested titles to choose from and all of them can be found by browsing our catalog or visiting your neighborhood library! Her name is Alma: Alma Sofia Esperanza José Pura Candela. Sometimes, Alma thinks her name is just too long - she needs extra paper to just to make it all fit! But there’s a reason behind each of her names, and when Alma learns what each of them represents, she discovers a world of family connections and history—all leading to one unique little girl named Alma. For middle-graders, this is a thoughtful look inside the Movement for Black Lives. 12-year-old Jerome is shot and killed by a police officer who mistakes his toy gun for a real one. The ghost of Jerome then meets the ghosts of many other black boys who were wrongfully killed, including Emmett Till. Strangely, the police officer’s daughter is the only one who can see Jerome, as he struggles to process what happened that day. Told in short, poetic chapters, this will help young readers explore a timely and difficult subject. 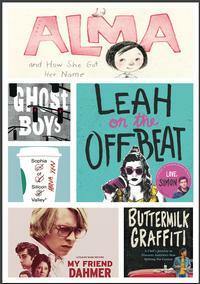 Leah has a lot to discover in this charming follow up to the massive bestseller Simon vs the Homo Sapiens Agenda. What happens when your friend group starts to splinter? Can she tell anyone (even Simon) that she’s bi? Will she always feel so different than everyone else? If you loved the first book or its movie adaptation Love, Simon, then you’ll definitely want to get your hands on this one. During the heady years of the tech boom, incorrigibly frank Sophia Young lucks into a job that puts her directly in the path of Scott Kraft, the eccentric CEO of Treehouse, a studio whose animated films are transforming movies forever. Overnight, Sophia becomes an unlikely nerd whisperer. Whether her success is due to dumb luck, savage assertiveness, insightful finesse (learned by dealing with her irrational Chinese immigrant mother), or a combination of all three, in her rarified position she finds she can truly shine. As Scott Kraft's right-hand woman, whip-smart Sophia is in the eye of the storm, sometimes floundering, sometimes nearly losing relationships and her health, but ultimately learning what it means to take charge of her own future the way the men around her do. But when engineer/inventor Andre Stark hires her to run his company's investor relations, Sophia discovers that the big paycheck and high-status career she's created for herself may not be worth living in a boys-club-gone-bad toxic environment. Edward Lee is the author of Smoke & Pickles and the chef/owner of 610 Magnolia, MilkWood, and Whiskey Dry in Louisville, Kentucky. He earned an Emmy nomination for his role in the award-winning series The Mind of a Chef, and more recently wrote and directed the feature documentary, Fermented. In his second book, Lee spent 2 years traveling all over the country to eat and ask about the people behind the food—a Cambodian chef in Lowell, Massachusetts, an Urghur cafe in New York’s Brighton Beach, and Ramadan in Dearborn, Michigan. The result of his journey was 16 vibrant chapters, plus 40 original recipes, demonstrating the evolving story of American cuisine. This film opens a window into the making of a serial killer whose conclusions are as empathetic as they are deeply troubling. Jeff Dahmer (Ross Lynch) is an awkward teenager struggling to make it through high school with a family life in ruins. He collects roadkill, fixates on a neighborhood jogger (Vincent Kartheiser), and copes with his unstable mother (Anne Heche) and well-intentioned father (Dallas Roberts). He begins to act out at school, and his goofball antics win over a group of band nerds who form The Dahmer Fan Club. This camaraderie can’t mask his growing depravity. Approaching graduation, Jeff spirals further out of control, inching ever closer to madness. Jeffrey Dahmer murdered 17 men and boys in the Midwest United States between 1978 and 1991 before being captured and incarcerated. He would become one of America's most infamous serial killers. This is the story before that story, adapted from the graphic novel by undeground comix writer and artist Derf—who just happened to be one of Dahmer's classmates. Check out these new titles by browsing our catalog or visiting your neighborhood library today!